more data. less chatter. more research. less politics. 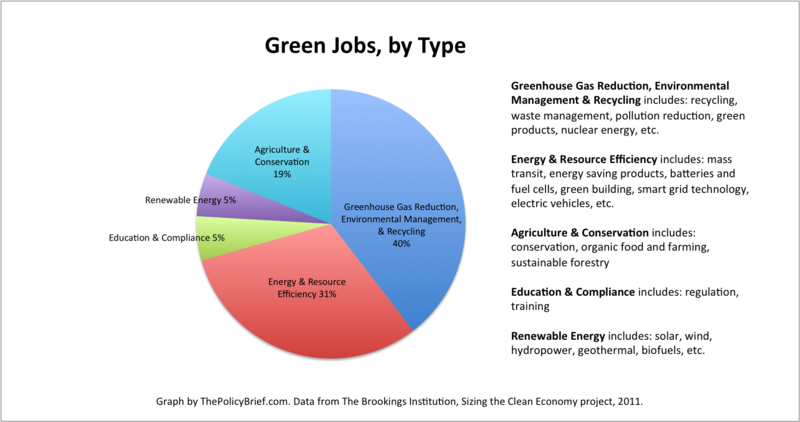 The Brookings project is one of the first to provide comprehensive, detailed data on the number, location, and type of green jobs available nationwide and to allow for comparisons across regions and localities. I’ll have a post later on where green jobs are located, but for now I want to focus on some highlights from the report about the size and scope of the clean economy. (1) While clean energy gets the most hype, the jobs are really found in sectors that have been around for a while – waste management/recycling, public transit, and conservation. The clean economy involves over 40,000 companies engaged in a diversity of activities and spread across sectors and industries, as you can see in the charts above and below. The largest share of green jobs are in fields that have been around for a while – waste management (14% of jobs), public transit (13%), and conservation (12%). Renewable energy, which gets much of the press, accounts for only 5% of the clean economy. (2) The clean economy is growing, but slowly. Young firms and sectors are experiencing the strongest growth. The clean economy has grown over the last decade: one-fifth of the 2.7 million green jobs in existence today were created since 2003. From 2003 to 2010, the sector grew at an annual rate of 3.4%, slightly lower than the 4.2% growth of the economy as a whole. But unlike the rest of the economy, the clean sector continued to see strong growth during the Recession, likely due to clean energy subsidies from the stimulus bill. It is the young firms and sectors that grew fastest in recent years. Four-fifths of the green jobs created since 2003 were in companies founded in or after 2003. Certain cutting-edge clean energy segments – wave/ocean power, solar thermal, and wind energy – experienced rapid expansion, averaging 15 to 20% growth annually. The green sector has been touted by some political leaders as an industry that can provide opportunities for workers at all educational and professional levels, provided they have the right training. The Brookings study provides some evidence for this claim: median wages in the clean economy are 13% higher than in the economy as a whole and these good-paying jobs aren’t just reserved for highly advanced professionals. 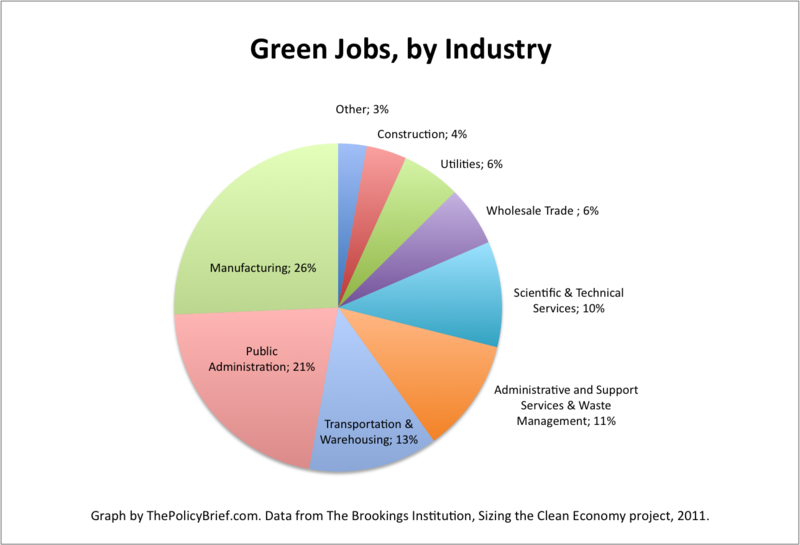 Nearly half of green jobs employ workers with a high school degree or less, compared to 37% of jobs in the economy as a whole. Many young people chose to weather the recession by hiding out within the confines of a classroom, hoping the economy would improve by the time they graduated. College enrollment jumped 6% between fall 2007 and fall 2008 (the largest increase in 40 years), driven primarily by increased enrollment among minority students and at two-year community colleges. Flash forward a few years and unemployment is still high, especially among young people. So did these college students make the right choice? According to a new Brookings Institution analysis of employment and earnings among 23 and 24 year olds in 2010, they did. Despite the fact that recent college graduates are earning less and are more likely to be unemployed than they were in 2007, those with a college education are still faring much better than those without. Among young adults, more education continues to translate into significantly higher earnings and employment rates, as can be seen in the graph above, suggesting that it may not take long for college grads to make up any earnings they sacrificed by choosing to focus on their education. While the economic benefit of a college degree is significant, I think the authors of this analysis overstate it slightly. They present two advantages of a college degree: the employment advantage (college graduates are more likely to be employed) and the earnings advantage (college graduates earn higher wages). But because their earnings figures include the entire population of 23 and 24 year olds, even those who don’t have a job, the employment advantage also gets folded into the earnings advantage. If you extrapolate from their data and look only at 23 and 24 year olds who are employed, those with a college degree make $660 a week and those with a high school degree make $477 a week. The earnings of employed college graduates are 40% higher than those of employed high school graduates, a slightly smaller figure than the 90% earnings advantage we see with Greenstone and Looney’s numbers. The Policy Brief offers a research-based, data-driven take on the political issues of the day. Are For-Profit Colleges A Scam?